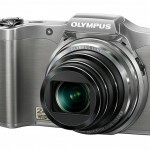 Olympus introduced an impressive little superzoom camera at CES this year. 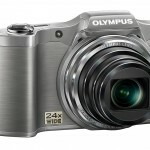 The 14-megapixel Olympus SZ-12 has an amazing 24x 25-600mm (equivalent) optical zoom lens crammed into a camera body about the size of an iPhone. To put the SZ-12 in perspective, the longest pocket camera lenses are 16 or 18x zooms. The SZ-12 is only marginally taller and thicker than competitors’ best pocket superzoom cameras but it has 1/3 more zoom range. 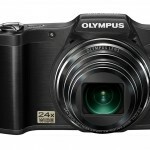 Five years ago, a camera with a 24x zoom lens would have been nearly the size of a digital SLR and as far as I know this is the longest lens in a truly compact camera so this is quite an achievement for Olympus. 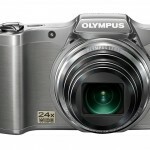 Other than the huge zoom lens, the Olympus SZ-12 is a pretty standard point-and-shoot camera. It can capture 720p HD video and it has dual image stabilization to help smooth out movies, eliminate camera shake and keep moving subjects sharp. Exposure control is pure point-and-shoot with exposure compensation, Intelligent Auto (iAuto )mode, 16 scene modes and 10 Magic Filters including Fish Eye, Pop Art, Pin Hole, Punk and Miniature. For composing and browsing photos, the SZ-12 has a 3-inch 460k LCD display. Too bad it doesn’t have manual exposure controls and full HD video. That would really push the SZ-12 over the top. 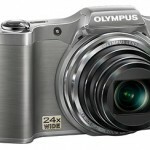 The actual dimensions of the Olympus SZ-12 are 4.19 inches (106.5mm) x 2.7 inches (68.7mm) x 1.56 inches (1.56 in). It’s scheduled to be available in March in red, black and silver. The suggested retail price for the SZ-12 is a very budget-friendly $199.99. I won’t argue with you on that point, Izzy. There is one exception – the XZ-1. It’s the best compact camera I’ve ever used. The lens and image quality are outstanding. Yeah, how’s the image quality? I do hope to eventually get a better and smaller point-and-shoot one of these days, and the thought of 600mm in my purse is pretty damn exciting. I don’t know, Patia. 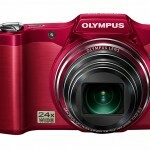 This camera was just announced last week. 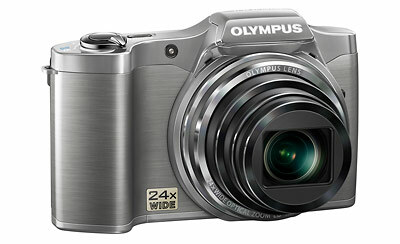 But other than the XZ-1, Olympus compact camera image quality hasn’t been very good for the past few years. Maybe there’s some improvement in this round of cameras but we’ll have to wait and see. I still want this one ….